The account window shows detailed information of all your spread bets and/or CFD trades, including open positions, real-time profit or loss, and a history of your transactions. 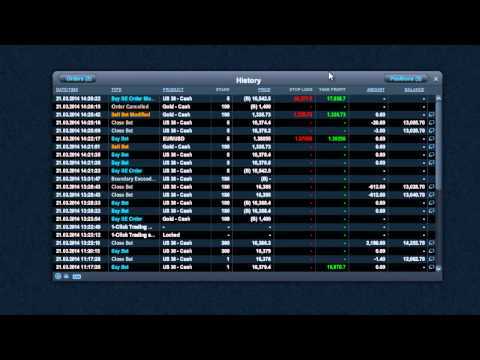 Hi there and welcome to a short video having a look at Account Module in a little bit more detail. As you can see there, you've got the product name, you've got the fact that you've bought or sold, your stake size, your average price that you've got into your possession, your real-time profit and loss, and details of any risk management that you have right there. You can also open up a sell or a buy order ticket by simply left-clicking on the price as per usual. From here as well, you can also expand your position out slightly to get the entire order number or if you've got an aggregate position, as we do right here. If I just minimise that for a second, I've got two trades running right there, and if I expand that out I can see the two child orders right here. This top section here is the aggregate, and then this is the two child orders. Now I can actually choose to close out of my trade by clicking on the little red X right here. I can choose to do the aggregate right here, or do one trade at a time. For example if I want to close out this trade, I simply left-click there, then click Confirm, and that trade's been done. And conversely, if I want to close out the entire aggregate position, you just click on the aggregate row, click the same button, click Confirm and that has been done. It really is as simple as that. You notice there that on my gold position right now, I don't have any stop loss or take profit added. All you need to do is click on Modify, that button right here, and it allowed me to... I can close out my position here if I want to. It gives me all the details of my trade right here. I can pop these sections up right here, add a stop loss and take profit, for example, if I want to have a stop loss set at 300 and a take profit set at 900, all I have to do is do it like so, and then click Modify. As you can see there, that's been updated there on my account module, no problem at all. So, my next section I'm going to quickly show you, is going to be my pending orders blotter. Now, from here I've got three pending orders, one in gold, silver, and (the) US 30. I've got a selection of stop entries to buy and stop entries to sell. You've got your stake size. You've got your expiry, which is GTC in this instance. I've got the trigger price right here. In fact, two of my orders right now have got boundaries set as well. I've also got details of any risk management. Again, if I want to cancel any of those, just click on the X button and then Confirm, or if I want to go ahead and modify these trades just click the Modify button. I can go ahead and add risk management, as simple as that. The last bit I want to quickly show you is the history tab, and the history tab is actually quite useful. It obviously gives you details of all your transactions on your account, be it opening trades, closing trades, stop losses being hit, take profits being hit, pending orders being executed, overnight financing, anything like that, so there can be quite a huge amount of detail on here. From here, you've actually got a little calendar function, so if you want to be quite specific about the time area right here, simple enough to select it from here. And you can also sort any of these sections. Any column there with any arrows attached to it, you can sort, as simple as that. And it's also worth noting that you've got this little information button right here. By left-clicking here, it gives you more of a detailed view behind each transaction that you've done, be it executing a trade or just your overnight financing. You've got all the time stamps and order IDs and everything else on here as well, and you can also see the price ladder. You can see exactly where you got executed. And, as you scroll down here, you can see a wide selection of different types. If you want to see some of your holding costs, for example, all you have to do is simply left-click here, and you can see all your holding costs right here, and then left-clicking on the View Additional Information will give you a full breakdown of all your overnight financing costs by product and the actual totals right here on the right hand side. And that is pretty much the main aspects there of the Account Module, but if I actually go up to Account right here, you can break these sections out separately, so you don't necessarily just have to utilise these areas right here. And there's actually one final piece which is the Execution Blotter. Now what the Execution Blotter does is it allows you to see any of your trades that were open or closed, plus any profit or loss that was attached to that. Sometimes I quite like to look at this just to get a bit of a flavour, how many trades have gone right, how many trades have gone wrong, and it's kind of a breakdown of the profit and loss. And it strips out a lot of the other noise that you do get on the history tab. Try CFD trading with virtual funds in a risk-free environment. Access our full range of products, trading tools and features.